The brilliant anatomist Dr. Thomas Silkstone returns in Tessa Harris’s vivid and compelling mystery series set in 1780s London. . . It is not just the living who are prey to London’s criminals and cutpurses. Corpses, too, are fair game–dug up from fresh graves and sold to unscrupulous men of science. 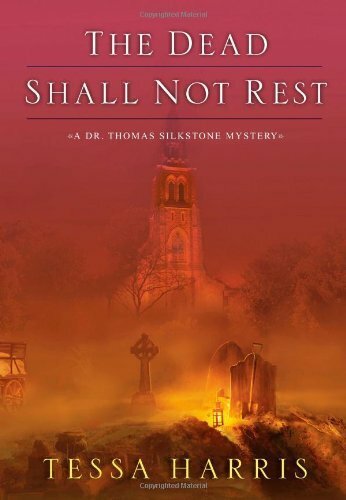 Dr. Thomas Silkstone abhors such methods, but his leading rival, Dr. John Hunter, has learned of the imminent death of eight-foot-tall Charles Byrne, known as the “Irish Giant,” and will go to any lengths to obtain the body for his research. Thomas intends to see that Byrne is allowed to rest in peace. Yet his efforts are complicated by concern for his betrothed, Lady Lydia Farrell, who breaks off their engagement without explanation. When Dr. Hunter is implicated in the horrific murder of a young castrato, Thomas must determine how far the increasingly erratic surgeon will go in the name of knowledge. For as Thomas knows too well, the blackest hearts sometimes go undetected–and even an unblemished façade can hide terrifying secrets. . .
1. What are the parallels between the powerful physicians in the novel and the multinational drug companies of today? 2. How does Thomas develop as a character in this, the second book in the series? 3. Does the course of the War of Independence affect any attitudes toward Thomas in this book? 4. Anatomists in the eighteenth century found corpses so hard to come by that they were forced to turn to grave robbers for a regular supply. Nowadays, more people donate their bodies to science. Would you? 5. Should organ donation be made compulsory? 6. Freak shows have long been considered an affront to human dignity, but in an age with little social welfare, what was the alternative for the severely disabled? 7. Charles Byrne and Count Boruwlaski both have major disabilities but are treated in very different ways. Why is this so, and how would they be treated today? 8. How far do revelations about Lydia’s past go to explain her submissive character? 9. Was John Hunter a medical visionary or an evil obsessive? 10. Charles Byrne’s skeleton remains on display in the Hunterian Museum in London to this day. Should he be given a proper burial?